Sega’s Tokyo Joypolis venue already has plenty of unique and interesting games and starting yesterday, a new multiplayer title is launching there that will appeal to Sonic and exergaming fans alike. Called Sonic Athletics, this brings eight characters from the Sonic universe and puts them into a track & field game for amusement venues. 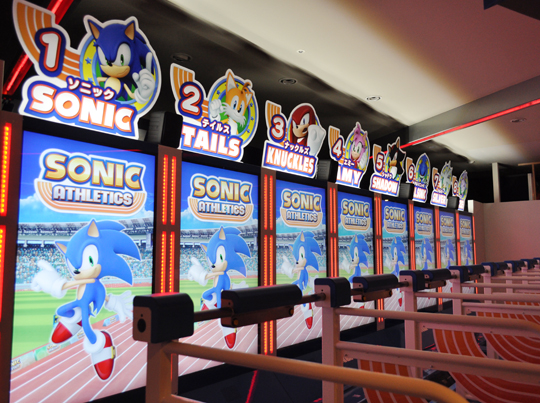 The game uses a treadmill (not the first time Sega has used such a thing in an arcade – their Walk The Dog game comes to mind UPDATE: As a bonus, Andy Lewis pointed out another Sega treadmill game located at another Joypolis location, see below) so that the faster you run, the faster your character moves. It’s not entirely clear if this is just a variation of the athletics mode in Mario & Sonic at the London Olympics. This picture below is the only direct photo of the setup shown so far but hopefully with it open to the public we’ll see more in the near future. There are a total of eight characters, the easy to see ones towards the left of Sonic, Tails, Knuckles, Amy and Shadow, then the last three on the right are Metal Sonic, Silver and Blaze. Here’s a link to the info page on the game on the Tokyo Joypolis website. If Sega still operated locations like Gameworks then I would expect to see this setup installed in those venues in the West but with that no longer being the case it seems unlikely. Affording an eight player setup of anything is usually a gigantic expense but if the game is decent then perhaps we will still see a Western release allowing operators to buy it as a single unit that can be linked. Who knows, perhaps chain locations like Dave & Busters or Round1USA will be nabbing a few for their busiest locations irregardless. I can see this doing well at large locations but I think sega could also make more compact version so more people could buy then, but then there would be the question of how many units to have since they’re not only more likely expencive but large too but what sonic fans wouldn’t want to give this at least one or more likely more times a go.